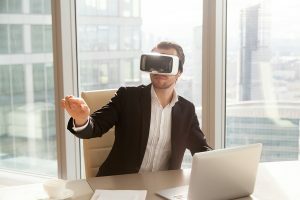 Virtual Reality (VR) and Augmented Reality (AR) technologies are becoming more mainstream in consumer life as well as in the business of government. While the military has long used virtual reality simulations for training, the Pokemon Go! phenomenon brought AR to the masses and opened the door for the use of virtual worlds in many more situations. Virtual Reality - A user is completely immersed in a simulated world. Usually achieved by wearing a headset or entering a simulation chamber. Virtual reality experiences tend to be solitary endeavors. Augmented Reality - A user can move around in the real world while interacting with the virtual world via a device, typically a smart phone.